The bodies of a British couple who died at a hotel in Egypt have been flown back to the UK, the BBC understands. 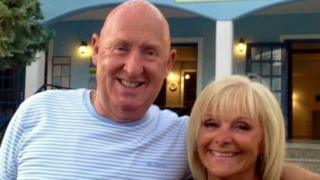 John and Susan Cooper, from Burnley, died in Hurghada on 21 August. Egyptian authorities released the bodies of the tourists on Friday. The results of post-mortem examinations are not yet known. Tests found high E. coli levels at the Steigenberger Aqua Magic Hotel but travel firm Thomas Cook said experts did not think this killed the couple. Egyptian investigators have said no traces of toxic gas had been detected. Thomas Cook previously said its independent food and hygiene tests identified "a high level of E. coli and staphylococcus bacteria" but its experts do not believe the results "shed any light on the still unexplained cause of death" of the couple. However, its specialists were unable to access the Coopers' hotel room, which is under the control of the Egyptian authorities. The travel firm removed its customers and has stopped its bookings for the hotel until further notice. The couple's daughter, Kelly Ormerod, who was also at the hotel, said she believed the deaths were not from natural causes.